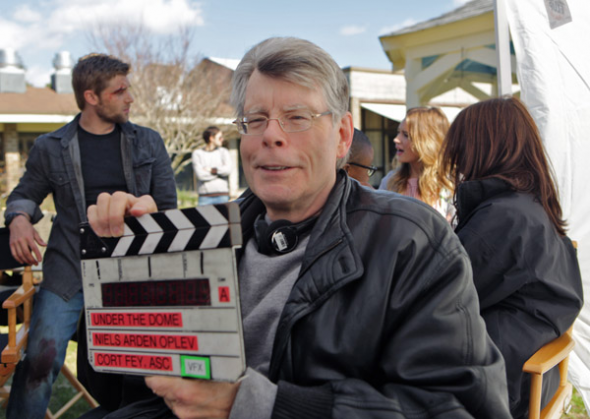 CBS has announced that production has begun on their new summer TV series, Under the Dome, in Wilmington, North Carolina. Based on a Stephen King novel, the show will start airing on June 24th. “THE DOME” DESCENDS ON WILMINGTON, N.C.
Thursday, Feb. 28 – Production has commenced today in Wilmington, N.C. for CBS’s new summer series, UNDER THE DOME. Acclaimed director Niels Arden Oplev (“The Girl with the Dragon Tattoo”) is directing the first episode. UNDER THE DOME stars Mike Vogel, Rachelle Lefevre, Dean Norris, Natalie Martinez, Britt Robertson, Alexander Koch, Colin Ford, Nicholas Strong, Jolene Purdy and Aisha Hinds. UNDER THE DOME is produced by CBS Television Studios in association with Steven Spielberg’s Amblin Television. Neal Baer, Stephen King, Justin Falvey, Darryl Frank, Stacey Snider, Jack Bender and Brian K. Vaughan, who wrote the television adaptation, will serve as executive producers. What do you think? Do you plan on checking out Under the Dome on CBS? More about: Under the Dome, Under the Dome: canceled or renewed? This show kept you glued to it, and I do really hate the Mayor.! I am so glad tha Mike Vogel will be back. cant wait to see who will break the dome. I do not plan on watching this show. It will take about 13 episodes for their air to run out, and they US Government will not nuke the dome in order to break it. I forget the name of the ‘bad’ cop but it would be wonderful if John Goodman could play the part. He would be perfect in that part. Have the book. Can’t wait!